Every now and then a article will catch my eye and I'll click on it, but not so much to read the article more to read the comments. usually they're stupid, whinny comments or just flat out jokes. 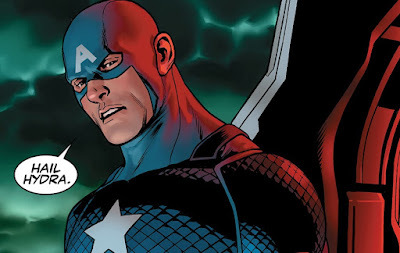 But on this occasion one really hit me as a perfectly articulated response to why Captain America being a agent of Hydra is wrong. I know it's a bit silly. I do. I joined the Army 23 years ago and went on to retire after a career I am quite proud of. I am no Captain America (The good one and certainly not the Nazi one), but Captain America was a character I could always identify with. When faced with the moral and ethical dilemmas I faced in my 21 years in the service, I always tried to maintain the values that Steve Rogers preached. It was never about being loyal to a system or a group. It's about being true to yourself and what you know to be right. I took many lumps along the way, knowing that I could stand up and face myself in the mirror every morning. This move by Marvel is so fundamentally and disgustingly wrong. There are so many other characters that could have been used to make whatever political point Marvel writers are trying to make. Captain America is the wrong choice on so many levels, the biggest and most important of which is the fact that he was conceived and created by Jewish writers as a beacon of hope against the Nazi aggression in Europe. This "jumping the shark" idea is so ill-conceived. It isn't art. It's an unfeeling and shameless gimmick. In the last several years, I have had discussions with friends about how antisemitic sentiment is becoming more acceptable as seen in media and entertainment. This just seems like one more example of a very disturbing trend. It isn't even attempting to mask itself. It is pretty blatant. It feels like petulance. "I'm a liberal angry with an America I hate. I have the power to destroy an American Icon, so I will. It will make me feel better about my own hate and anger." There really aren't too many heroes that Soldiers really identify with. The ones they do are pretty extreme. The Punisher and Captain America are among the top two. Both are men of conviction. Both have a very developed sense of right and wrong. One appeals to the darker nature of the job we are given. It's appealing to have the conviction that all of our actions are justifiable and righteous in the end, and thereby avoiding any feeling of guilt. The other is who we all really want to be in uniform. The one who avoids guilt, because he truly knows he made the right decisions based morals and ethics. I never boycott anything really. It's not in my nature. This, however, has me swearing off Marvel as a brand. I am just one man, but I know I've spent more than my share on movies and merchandise. It's just such an ugly attack. It feels personal. Thank you Mr. Eckert for your service and this well crafted response.